Our long-term supporters at Everything Branded recently kindly donated 500 tote bags to use in our creative projects with young people. Over the past month we have had a number of public and business reception events at our youth arts centre on New Walk. 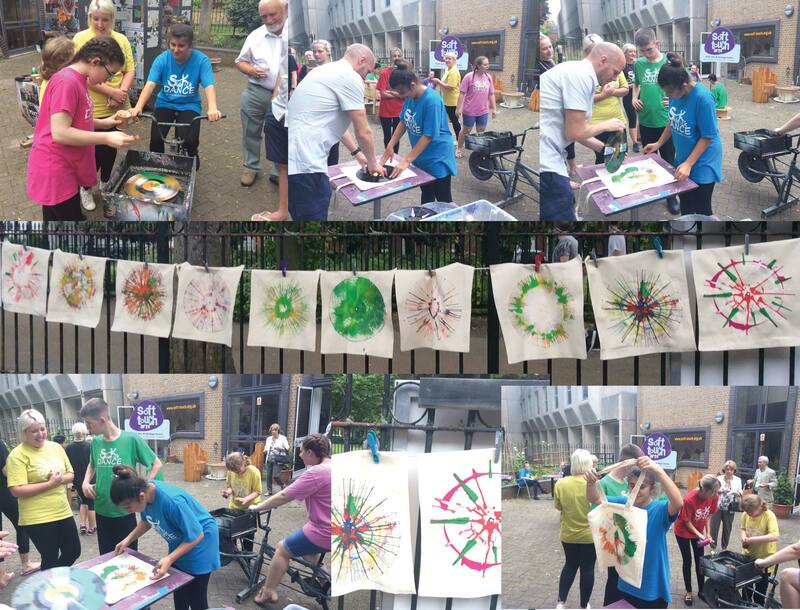 Young people involved in our projects have been using their creativity to make some amazing prints on the donated bags, and have been demonstrating their talents to invited audiences of business people and the general public. Our pedal powered paint wheel bike has been a particularly popular way to create some stunning bags. Paint is dropped onto an old vinyl record at the front of the bike, whilst someone pedals causing the record to spin. When the person applying the paint is happy with their record printing plate it is pressed onto the bag, and when the record is taken away a beautifully printed bag is the result. The support of Everything Branded in donating the bags is a great example of how a local business is supporting a local charity. Materials for our projects are expensive to buy, so this donation is really supporting us financially and helping the young people we work with to learn new creative and communication skills.